16 • October 2014 • S I G N & D I G I T A L G R A P H I C S Fibermark Acquires Crocker Technical Papers West Springfield, Massachusetts- based FiberMark, a manufacturer of paperboards, fiber-based specialty covering materials and print media, announces that it has acquired the assets of Crocker Technical Papers, Fitchburg, Massachusetts, a provider of custom-engineered multi- layered specialty papers and boards. Crocker will become a part of FiberMark's technical specialties and performance boards business in which FiberMark will adopt the Crocker brand name. FiberMark will continue to serve the industrial markets with electrical insulation specialties, archival quality paper and boards, photographic packaging, specialty coating base and other industrial specialties. Larry Gelsomini, president and CEO of Crocker Technical Papers, will join FiberMark as general manager of the Fitchburg plant. Digital Signage White Paper Now Available The new free white paper, "Dynamic Digital Signage Opportunities for Sign Companies," is now available providing valuable data and insights for sign shops looking to enter the digital signage market. The paper, created through a partnership between sign-making equipment manufacturer Roland DGA, Irvine, California, and the International Sign Association (ISA), is a nine-page document, complete with images, charts and illustrations, provides a comprehensive overview of the fast-growing digital signage market and examines opportunities for traditional sign shops interested in expanding their businesses and increasing profits by introducing new and existing customers to digital signage. 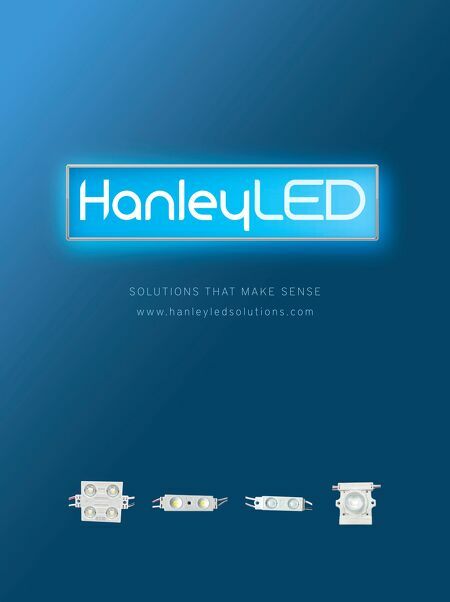 The new Roland/ISA-sponsored white paper is free and can be downloaded by clicking the following link: http:// www.rolanddga.com/DSSwhitepaper. K.C. 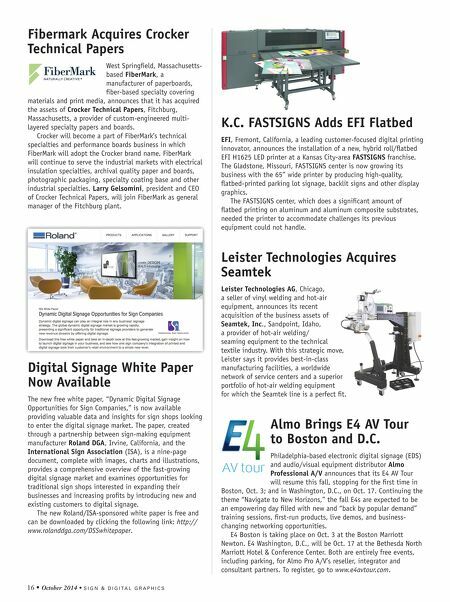 FASTSIGNS Adds EFI Flatbed EFI, Fremont, California, a leading customer-focused digital printing innovator, announces the installation of a new, hybrid roll/flatbed EFI H1625 LED printer at a Kansas City-area FASTSIGNS franchise. The Gladstone, Missouri, FASTSIGNS center is now growing its business with the 65" wide printer by producing high-quality, flatbed-printed parking lot signage, backlit signs and other display graphics. The FASTSIGNS center, which does a significant amount of flatbed printing on aluminum and aluminum composite substrates, needed the printer to accommodate challenges its previous equipment could not handle. Leister Technologies Acquires Seamtek Leister Technologies AG, Chicago, a seller of vinyl welding and hot-air equipment, announces its recent acquisition of the business assets of Seamtek, Inc., Sandpoint, Idaho, a provider of hot-air welding/ seaming equipment to the technical textile industry. With this strategic move, Leister says it provides best-in-class manufacturing facilities, a worldwide network of service centers and a superior portfolio of hot-air welding equipment for which the Seamtek line is a perfect fit. Almo Brings E4 AV Tour to Boston and D.C. Philadelphia-based electronic digital signage (EDS) and audio/visual equipment distributor Almo Professional A/V announces that its E4 AV Tour will resume this fall, stopping for the first time in Boston, Oct. 3; and in Washington, D.C., on Oct. 17. Continuing the theme "Navigate to New Horizons," the fall E4s are expected to be an empowering day filled with new and "back by popular demand" training sessions, first-run products, live demos, and business- changing networking opportunities. E4 Boston is taking place on Oct. 3 at the Boston Marriott Newton. E4 Washington, D.C., will be Oct. 17 at the Bethesda North Marriott Hotel & Conference Center. Both are entirely free events, including parking, for Almo Pro A/V's reseller, integrator and consultant partners. To register, go to www.e4avtour.com.